Do you have a decent Social Media reach? Do you want to become a Social Media Influencer and earn some bucks? Somo might help you to start your journey. Somo is the world’s first social media advocates driven marketing platform headquartered at Delhi. 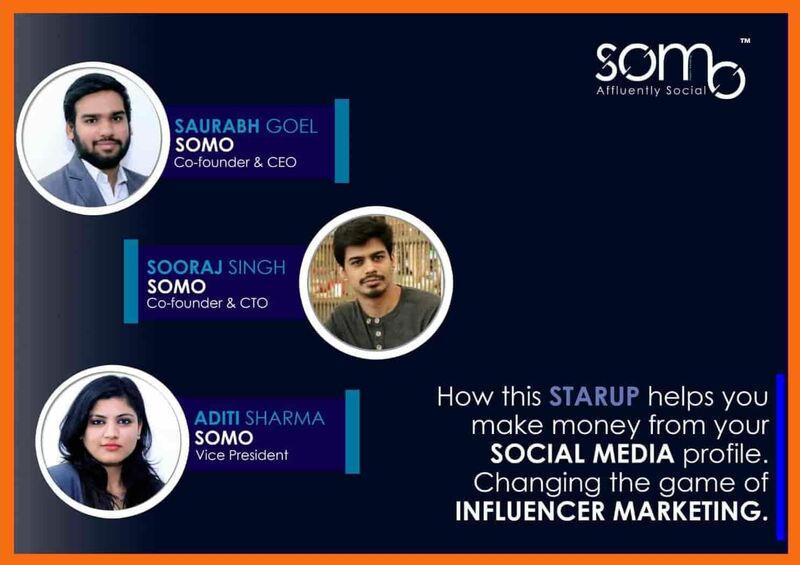 Somo connects business as advertisers with social media users as influencers. Thus, helping companies to reach out to closer to people at micro level and at the same time helping social media users to earn some money. We interviewed the Co-founder, Mr. Sooraj Singh to learn about his journey of building Somo. Every brand owns a digital space in today’s time. It is because digital marketing benefits businesses of all sizes by giving access to the mass market in a cost-effective & measurable way. According to IAMAI Report, "The growth in spends on Digital Advertising is expected to continue at a CAGR of 30% to touch INR 12,046 Crore by December 2018 in India". However, the existence of Ad blockers, Blind Spots & Bot Traffic has stopped the communication between digital marketers & their targeted audience, thus jeopardizing a brand’s overall success. Also, there is no platform that enables social media user to become an Influencer immediately & to monetize the profile. Micro users are always most influential in order to promote services or products of brands. Furthermore, Somo mobile application is the world’s first mobile application that not only helps users to monetize their social media profiles but also quantifies the influential power user has on social media. Somo’s long term vision is an expansion on all social media platforms as well as global expansion. Somo is a venture by two young & passionate entrepreneurs, Saurabh Goel & Sooraj Singh. Saurabh is a serial entrepreneur with years of experience in marketing & sales. He is an electrical & electronics Engineer. He started his entrepreneurial journey at the age of 18. After working with Simpli5d Technologies for almost 2 years, he had an idea of starting his own digital firm along with his college friend Sooraj Singh. 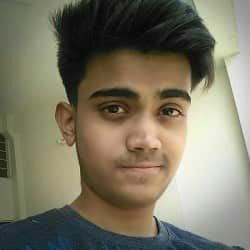 Sooraj Singh is a Computer science engineer & coder since childhood. He has significant experience in different technologies and blockchain. Aditi Sharma (VP Marketing) - She has a master’s degree in Science. She has significant experience in Business Development & Digital Marketing. We were always passionate about building something that can make an impact and contribute effectively to the existing problems around. We believe problem itself is a solution and that is why we started our first venture together named as WebAssets in 2016 with a vision to transform the digital marketing industry. Through WebAssets, we provide very economical services to startups, restaurants and schools so as to fulfil their digital requirements. We initially developed our expertise towards digital marketing and sooner figured out declining effectiveness of digital marketing. We then worked towards innovating new generation of digital marketing. Finally, we are up with Somo: World’s first social media advocates driven marketing platform. We have already gained early traction through Somo. Somo is the World’s first Social Media Advocates Driven Marketing Platform. In the word Somo- “So” represents Social & “Mo” represents Monetization. We are quantifying the influential power of Social Media users in the platform & helping them to monetize their influence on Social Media & Let them begin the journey of a Social Media Influencer. Thus the Name “Somo” Social Monetization. Somo is a Patent Pending Technology, registered under "Startup India Program" & "MSME". The mobile app of Somo lets brands go viral on social media when thousands of KYC verified Social Media users share their content. After the "Sign Up" on the Somo Application, user gets to see several posters of various brands which they can share directly to their Social Media profile. Once they share a post, they earn a certain percentage of revenue which brands pays. Through this model, the user can start monetizing their Social Media profile directly from the very first day. Once a user shares a post, our integrated algorithm starts tracking several factors to understand the influential power of the user on Social Media. These factors include the number of engagements, number of clicks, number of views etc. This way we put Social Media users in different leagues of influencers like the Bronze league, silver league, gold league etc. This solves a big problem of monetizing Social Media profile for users as well as to understand the influential power one can have on Social Media. For Brands, with the declining effectiveness of native digital advertisement & the rise of bot engagement on Social Media, it is the need of the hour to take a step forward. Somo plays an important role here by getting the brand’s post shared by multiple users directly from the app. This burst of posting organically on Social Media ultimately delivers high ROI as content now goes in a more integrated and a recommended way on Social Media channels rather than going like a blind spot ad. Also, the chances of bot engagement become negligible because of the KYC verification of Micro-influencers. Brands also get deep insight reports on the performance of the campaign. KPI is delivered through a user-friendly dashboard consisting of graphical analysis representing important KPIs like number of shares, comments, views, etc. Somo builds up a win-win situation for both brands as well as Social Media users. It gives a dual opportunity for both users & brands. Users can monetize their social media profile & start the journey of being a popular social media influencer and brands can get an organic shootout through the power of these engaging social media profiles, along with the real engagement. Somo mobile application monetizes the users' basis upon their influential power on social media and ranks them in the leaderboard for them to stay rewarding. We have two revenue models. The main being, we retain a percentage spent by brand as a platform fee and share the remaining revenues with brand advocates. In the SaaS model, we give the control of Somo platform to the brands. We charge a particular fee from the brands to use our model and brands decide what they have to pay to the Brand Advocates. Users acquisition is done through both online and offline activations. Online activation includes digital campaigns executed through Somo, Google Ads, Facebook etc. whereas offline activation is carried through the student ambassador program at the mass level. ‌‌We are doing brand acquisition through e-mails and agency connects. Somo has already started shaping up the new generation of digital marketing. The company has already collaborated with popular brands such as Mamaearth, Travelur, Milaap, Evibe, Behrouz Biryani, Ovenstory, MomsCo and a lot more! Just within the first month of the application’s launch, Somo received an enormous response . More than 10000+ downloads were done and it had more than 7,000+ registered users. We are into the closing phase of our seed round. We do not have direct competitors. The ones we have are indirect competitors but we are very much different in terms of customers segmentation, business model and execution strategies. Read more: Who are the major competitors of Mobikwik? We are very much clear with our future plans. Once we integrate all the relevant social media platforms, we look forward towards global expansion via licensing our technology to various parts of the globe. We are planning exponential expansion across different Social Media platforms & geographies in quick time. We are expecting more than 1 Million downloads in the next 12 months. Soma has recently been awarded with Kotler’ Excellence Award at the World Marketing Summit, 2018. Today's youth especially Indians needs to learn the risk-reward system. Going with the safest thing for the career is not always the right one. Most people during their teens aspire to have a completely different path then what they end up doing because they think it has the most career stability. There is a part of life which for taking risks and it is the youth. However, the risks should always be calculated and should have a good risk-reward ratio. I am a visionary content creator and internet researcher.